Old English 800, Magnum, Colt 45, King Cobra, Schlitz, O'Keefe's Extra Old Stock, Crazy Horse, St. Ides and Mickey's. Especially Mickey's. I drank my share of malt liquor in my misspent youth. The name of the game was maximum buzzage on a budget. Flavor was not a huge factor in that game at all. All of them had a skunk essence to them in the way that they tasted (and smelled), finding the skunk essence that seemed the most palatable to inexperienced taste buds was as far as any of my friends or I went when it came to that aspect of them. Over the past few years, I've spotted a craft brewery here and there offering a malt liquor. Every time I've seen one at a market I've grinned but, now being a "mature adult with an experienced palate" (or at least that's what I tell myself), I wasn't too sure if I could, or should, dip my tongue into such a style again. "What the hell. Go for it" I told myself as I reached for Odd Side's Laughing Clown and brought it up to the counter. I mean, if for nothing else, they are one of my most favorite home state beer makers and each purchase of their stuff I buy puts some dough back into several different sections of the Michigan economy. A semi-hard pour brings out a finger sized rocky head on this orangish yellow brew. It holds on for a few before melting into some a few clouds as a cap through the rest of the glass. Lacing is light and spotty. The aforementioned familiar "skunk" scent that comes with the standard 40oz offerings of malt liquor is here but it is faint as aromas of freshly baked bread, sliced green apples, ground black pepper and brown sugar take the spotlight. "Hmmm. A cheap date but cultured and refined one too" was the thought that came to mind. Such a thought is a good way to describe the flavor too. The skunk is one similar to that of Mickey's (and to some extent Heineken for those who may know what I'm talking about) but it's around the edges and not the dominant thing here. Instead, biscuit-like grains, lemon peel and a malty sweetness are the main event. There's a bit of malt and grain brawn throughout the beer along with a hint of corn adjuncts that I suppose need to be there to remind you that, after all, this is a malt liquor. It finishes dry and earthy with grassy and slightly bitter hop notes but nothing too sticky. 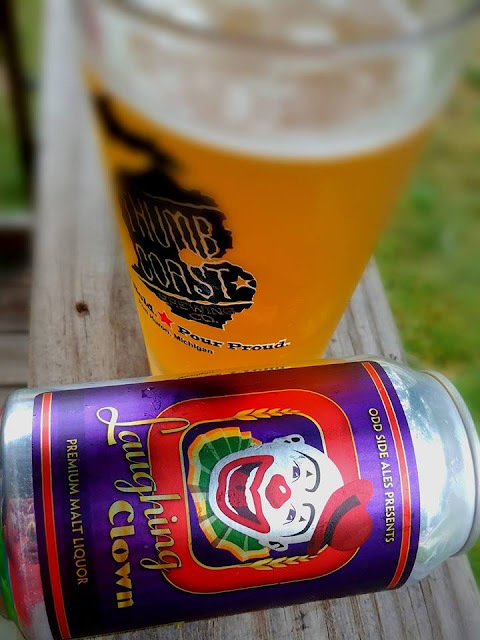 Laughing Clown may not be for the coulrophobic nor is it probably named in tribute to the band Ed Kuepper formed after he left the Saints, but I could find myself crushing a few cans of this quicker than I could get through a $2.69 GIQ these days.